Special Offer. Buy 6 Bottles for £25.00 each. Save £15.00 !! Light yellow in colour with green highlights. A strong and generous nose, slightly woody and spicy, characterised by an aromatic richness, blending toasty and buttery aromas. A full, fruity and well-structured palate with blackcurrant notes and a hint of lemon, with a slight yeastiness on the finish. A fragrant and full-bodied Champagne with hints of blackcurrant and lemon, and a touch of yeast. A vigorous and lively wine, ideal as an aperitif. With a meal, it is a perfect accompaniment to seafood and white meats. A 'Grande Marque' champagne - one of the top names in Champagne. Vineyards are in the 3 main areas of Champagne - Cote des Blancs, Vallee de la Marne and the Montagne de Reims. The production facility for Heidsieck Monopole is at Tours sur Marne in the village of Bouzy. The Head winemaker is Dominique Pichart. He was born in Avize , the famous "Grands Crus' village. 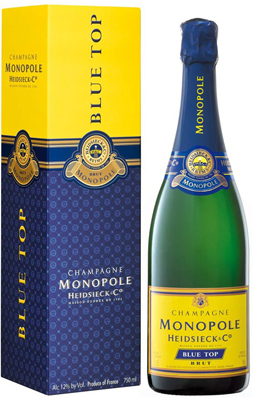 He has worked with Vranken Pommery Monopole for over 20 years.